DOT approved! This high quality helmet offers great protection for your noggin while protecting you from the elements. The extra padding around your neck and ears zips out for those warm summer days, and you can open the two small vents above the visor for extra cooling. 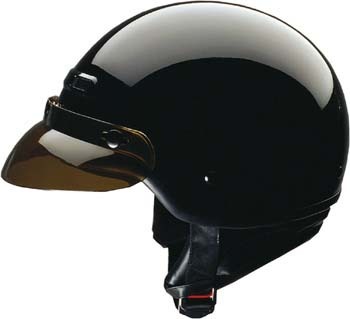 The fiberglass shell has an extra glossy finish, and the visor also snaps off if you want to go without it or replace it with a larger bubble type. NICE!